Empirical historical evidence combined with little common-sense are enough to tell us the type of future options that Israel has in store for the Palestinian people: perpetual Apartheid or ethnic cleansing, or a mix of both. The passing of the ‘Regularization Bill‘ on February 6 is all we need to imagine the Israeli-envisaged future. The new law allows the Israeli government to retroactively recognize Jewish outposts built without official permission on privately-owned Palestinian land. All settlements – officially recognized settlements and unauthorized outposts – are illegal under international law. The verdict has been passed numerous times by the United Nations and, more recently, pronounced with unmistakable clarity in UN Security Council Resolution 2334. Israel’s response was the announcement of the construction of over 6,000 new housing units to be built throughout the Occupied Palestinian territories, the construction of a brand new settlement (the first in 20 years), and the new law that paves the way for the annexation of large swathes of the Occupied West Bank. Undoubtedly, the law is the ‘last nail in the coffin of the two-state solution‘, but that is not important. It never mattered to Israel, anyway. The talk of a solution was mere smoke and mirrors as far as Israel was concerned. All the ‘peace talks’ and the entirety of ‘peace process’, even when it was in its zenith, rarely slowed down the Israeli bulldozers, slowed down the construction of more ‘Jewish homes’ or ended the unceasing ethnic cleansing of the Palestinians. 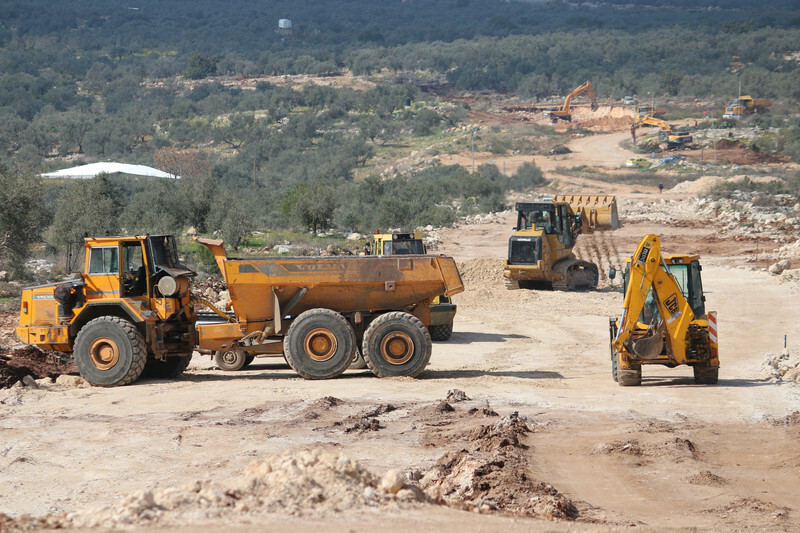 Writing in ‘Newsweek’, Diana Buttu described how the process of building settlements is always, always accompanied by the demolition of Palestinian homes. 140 Palestinian structures were demolished since the beginning of 2017, according to the United Nations Office for the Coordination of Humanitarian Affairs in the Occupied Territories. Since Donald Trump was sworn in, Israel has felt liberated from its obligation to doublespeak. For decades, Israeli officials spoke passionately about peace, and did everything in their power to hinder its attainment. Now, they simply do not care. Period. They have perfected their balancing act simply because they had to, because Washington expected it, demanded it. But Trump had given them a blank check: do as you please; settlements are not obstacles to peace; Israel has been ‘treated very, very unfairly‘ and I will correct that historical injustice, and so on. Almost immediately after Trump was inaugurated President on January 20, all masks came off. On January 25, the real Benjamin Netanyahu resurfaced, dropping his act altogether, and declaring in enviable brazenness: “We are building, and we will continue to build” illegal settlements. What more is there to talk about with Israel at this point? Nothing. The only solution that mattered to Israel is Israel’s own ‘solution’, always driven by blind American support, European uselessness and always imposed on the Palestinians and other Arab countries, by force if needed. The guardians of the grand charade of the two-state solution, who shrewdly crafted the ‘peace process’ and danced to every Israeli tune are now bewildered. They have been outed by Israel’s dreadful plans that shot their ‘solution’ right between the eyes, leaving Palestinians to choose between subjugation, humiliation or imprisonment. Jonathan Cook is right. The new law is the first step towards the annexing of the West Bank or, at least, most of it. Once small outposts are legalized, they would need to be fortified, (‘naturally’) expanded and protected. The military occupation, in effect for 50 years, will no longer be temporary and reversible. Civil law will continue to apply to Jews in Occupied Palestinian Territories and military laws on occupied Palestinians. It is the very definition of Apartheid, in case you are still wondering. To meet the ‘security needs’ of the settlers, more ‘Jewish-only’ bypass roads will be constructed, more walls erected, more gates to keep Palestinians away from their land, schools and livelihood will be put up, more checkpoints, more suffering, more pain, more anger, and more violence. “There is so much land left. And every time you take land for settlements, there is less land left,” Trump said. He is backtracking on promises he made with regard to moving the US embassy and the unchecked expansion of the settlements and more, as he is realizing that Netanyahu and his US supporters have led him to a cliff and are now asking him to jump. But it matters little, anyway. Whether Trump holds on to his extremely pro-Israel position or reverts to a wishy-washy stance similar to that of his predecessor, Barack Obama, reality is unlikely to change – for only Israel is ultimately allowed to influence outcomes. Israeli lawmakers’ approval of the bill is, indeed, an end of an era. We have reached the point where we can openly declare that the so-called ‘peace process’ was an illusion from the start, for Israel had no intentions of ever conceding the Occupied West Bank and East Jerusalem to the Palestinians. The Palestinian leadership is hardly blameless in all of this. The greatest mistake that the Palestinian leadership has committed (aside from its disgraceful disunity) was entrusting the US, Israel’s main enabler, with managing a ‘peace process’ that has allowed Israel time and resources to finish its colonial projects, while devastating Palestinian rights and political aspirations. Returning to the same old channels, using the same language, seeking salvation at the altar of the same old ‘two state solution’ will achieve nothing but waste further time and energy. But Israel’s humiliating options to the Palestinians can also be read in a different way. Indeed, it is Israel’s obstinacy that is now leaving Palestinians (and Israelis) with one option, and only one option: equal citizenship in one single state or a horrific apartheid and more ethnic cleansing. That Israeli ‘permission’ is yet to arrive, leaving the international community with the moral responsibility to exact it. …..This as to be expected…! Trump has been brazenly supporting Israel right of massacre even before his elections and on many occassions openly expressed his disdain at UN declaration. Now he cares a damn for either international opinion or UN warnings. Israel has a ‘ shot in the arm’ and can go to any extent in occupying Palestinian lands . The west has divided Palestinian leadership even from the time of Egypt president Sadat in Camp David accord with Carter. The division has become a permanent feature. Weak Palestine struggle isbstrength to Israel. So, the Israeli government is exploiting fissures in Palestine struggle . Palestine future, at the moment, is horrying and terrifying …!